Can I grow fruit in containers? Most fruit can be grown in containers - even apples and pears. Growing fruit in containers is often the only option for gardeners with restricted space, but far from being a poor choice this method of growing fruit offers many benefits. The secret is choosing the right type of plant and training method. Because it will be very heavy once filled, move the pot to its final position before potting up the plant. The pot should be set on bricks or pot feet to aid drainage. Place crocks in the bottom of keep soil within the container. Mix a loam-based potting compost, such as John Innes No 3, with some controlled-release fertiliser in a large bucket or wheelbarrow and place some of the mix in the pot. Then set the tree in the pot; if the roots are too long for the pot, trim them with secateurs. If planting a fruit tree, make sure that the knobbly part of the trunk (graft union) is level with the top of the pot, and start to backfill with the compost mix, firming the soil around the roots and into the sides of the container. Leave about 2cm (34 in) between the rim and the top of the compost. Then water the plant in well. Fruit in a pot will probably need daily watering during dry periods in the growing season - never allow the compost to dry out. Once the plant starts to flower, it may also need a liquid feed each week with a high-potash fertiliser (such as tomato food) until the fruit begins to ripen. Feed annually in spring with a controlled-release fertiliser. Once established, fruit may need to be repotted every two years. Lie the pot down on its side and gently ease out the plant. Scrape away any excess soil from the rootball and use a knife to cut through any roots that appear to be restricting growth. 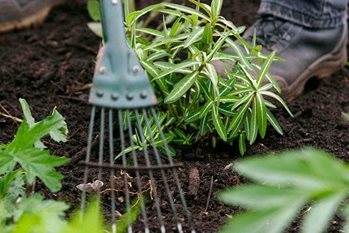 Replant using fresh potting compost - John Innes No 3 mixed with controlled-release fertiliser - a garden centre or nursery will be able to guide you. Can I grow vegetables in containers? Indeed you can. The following are very rewarding crops, but don't limit yourself - experiment. Very early sowings are best made in a greenhouse, conservatory, shed or garage and then the containers moved outside when it's warmer. Crops can be protected from cold and frost by covering with fleece. Most crops will grow perfectly well in a multipurpose compost, either peat based or peat free. John Innes No 3 compost is easier to maintain and water but heavier and relatively expensive. Mixing composted manure into the compost in the lower half of the container is a very effective organic fertiliser or add a controlled-release fertiliser, such as Osmocote, before planting. Salads and herbs thrive in relatively shallow containers. A depth of as little as 15cm (6in) can give good results. You can get the quickest harvests and best yields by growing salads as ‘baby leaf’ crops. Sow seed evenly and thinly over the surface of the container. Aim for plants about 2.5cm (1in) apart each way, cover with a sprinkling of multi-purpose compost and water well. Start picking leaves when they are 10cm (4in) high. Sow regularly so you get a continuous supply. Start the earliest in March in pots a light, warm spot, but move to semi-shade for midsummer sowings. Keep plants continually moist. If growth is poor, feed regularly with a general-purpose liquid feed once the harvest has begun. You can get liquid feeds from garden centres, supermarkets and nurseries. These tender fruiting crops appreciate the warmth created by walls and paving, making them good candidates for growing in large containers or growing bags in a sunny spot. Looked after well, they should fruit for several months during summer and early autumn. Cultivars described as ‘patio’ selections are usually compact plants, often with smaller fruit. Other cultivars will still grow well, but may need propping up with stakes or pinching off long stems to keep them neat, and large-fruited cultivars may only produce relatively small numbers of fruits. Added value comes from these crops in their attractive flowers and pods. Use at least a 10-litre pot, and keep plants well watered or the flowers will not set. Dwarf sugar (mangetout) peas such as ‘Norli’ do well early in the year, giving young shoots and tendrils for salads as well as a harvest of pods. Sow seeds in March to May about 5cm (2in) apart, equally distributed over surface of the container. Provide a wigwam of canes and string or twiggy sticks for them to climb. Dwarf French beans can also give a worthwhile harvest, and cultivars with coloured pods such as ‘Purple Teepee’ and ‘Golden Teepee’ are particularly decorative. Make two sowings direct into containers in May and June for a July to September harvest. Space plants about 10cm (4in) apart each way. Runner beans are more demanding plants, and flowers turn into fruit less reliably, although they give a wonderful show of flowers. Dwarf cultivars, which have short pods, are the most suitable. Plants can either be raised from seed in a greenhouse early in the year, or bought from garden centres or catalogues in May or early June, for planting once the threat of frost is past. Cover young plants with fleece on cold nights. The mature plants can be demanding – they will need daily or twice-daily watering in hot weather, and feeding regularly with tomato liquid feed once the flowers and fruit form. Mulching the surface of the container with bark or gravel can help to conserve moisture. We're a UK charity established to share the best in gardening. We want to enrich everyone's life through plants, and make the UK a greener and more beautiful place.